It was Q's birthday on Friday. 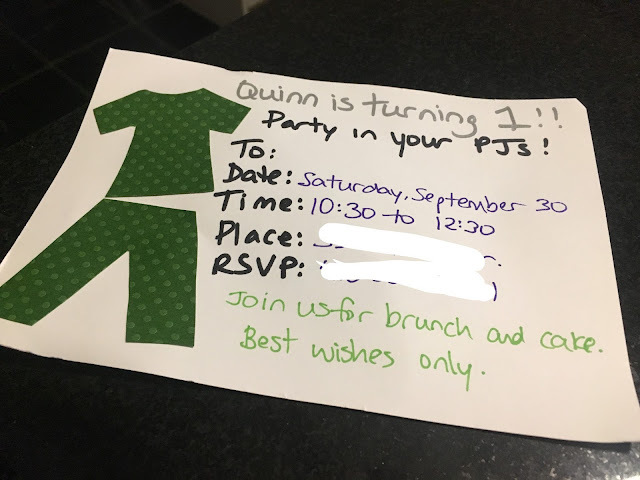 I took the day off, but not so we could spend the day together, just so I could get everything done for his party the next day! I did get up early so I could make pancakes for breakfast. They are everyone's favourite, but Q really enjoys them. Despite my best efforts, I still wasn't able to get everything done that I wanted to do, but it was a mostly successful day off. After supper our babysitter came over and Dave and I got on the subway to go to see Mike Birbiglia at the Sony Centre as part of the Just for Laughs Festival. We like Mike Birbiglia; check out his Netflix specials. The show was great, all new material. He reminds me a little of Stuart McLean (of CBC's The Vinyl Cafe), he makes you laugh but includes a nostalgia and sentiment that is really touching. After the show we stopped in at Jack Astor's for nachos and beer. A great night out! The next morning we opened some gifts with Q. E was so excited it was hard to stop him from opening all of the gifts himself. Then it was time to get ready to party! We invited a couple of families from our neighbourhood, two of which have kids born last year too - Q's future friends! For brunch we served mini quiche, bacon, tater tots, fruit, yoghurt, and pumpkin chocolate chip muffins. The favours were little boxes of cereal with sporks attached. My cake visions are always bigger than my talent, but the cake tasted good, so that's all that really matters. Q loved his piece of cake! After the party, Q was pooped! He went right down for his nap so E and I took off to do some errands. We went to the Halloween store to get E's costume and then to the library. I told him to wait here while I picked out my own book. When we got back the boys enjoyed a little time on our new yard. Around 4:30 we went down the street to a BBQ hosted by our new neighbours. E had no problem getting himself a plate of fruit and a hot dog. On Sunday morning Q ate breakfast off his new plate. It's silicone so it won't shatter when he will inevitably throw it on the ground, and it has a suction cup on the back so it will mostly stick to the tray. Dave went for a long run and the boys and I went to church. E had a friend over in the afternoon and I did some grocery shopping and baking. I made some gnocchi for supper. After supper we took a quick walk to the park to enjoy the last of the sunlight. A successful weekend complete with a party!